They should consider themselves lucky they are together, because their compatibility is great. When the Aries man and the Aries woman meet, they will immediately spot the boldness and the independent spirit in one another. She loves to be courted and he is happy to do it. These two can be the perfect couple. Their relationship will be electrifying and interesting, as they have chemistry and a great passion for each other. Two Aries together will always be up for new things and will try to impress. Competitive, they may turn their dates into contests of who resists a spicy sauce more, or who knows what time it is with their eyes closed. An Aries man will be very attracted to an Aries woman, and vice versa. They are both enthusiastic and it’s very difficult to control them. Not to mention they are true egoists who need to make an effort to keep their lives in balance. As they are both Fire signs, their relationship will be protected by this element. Astrology concludes that they can have a passionate union, but they will also fight badly when they have a disagreement. Their feelings for one another will be strong and real. It’s almost like they are soulmates. Nothing in their life as a couple will be boring as they are both adventurous and eager to take on new challenges. People will envy them for being able to make each other’s dreams come true. They will not only have a great time together in bed, they will also be best friends. There will be no one an Aries man or woman will trust more than his or her Aries partner. And what’s interesting about them is that they will never act submissive with each other. If someone provokes them, they will proudly and fiercely protect each other till they have defeated the outsider. Let’s not forget the Aries is the Warrior in mythology. Arieses like to lead and this means a clash between the man and the woman in this sign is inevitable. She will convince him he’s the one in charge, while she’ll control everything. If he realizes this, he will immediately start an entire campaign to become the boss again. They should consider themselves lucky they are together, for their compatibility is good and they are both romantic. He will never be impressed by her independence, no matter how strong and powerful she may be. 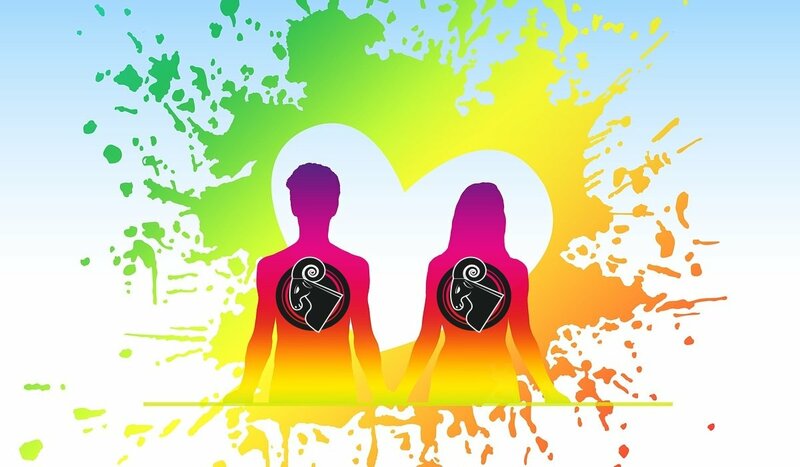 The Aries woman – Aries man couple can be an emotional one. They can have disputes in which they will both raise their voices and hurt each other. Neither of them will want to give in in a fight. They are cocky people and this can have consequences. Another problem they may have is that they are both jealous. When it comes to their exclusiveness, they will have to be 100% devoted and loyal to one another. Not even an innocent flirt will be allowed. As soon as something like this happens, their relationship will be immediately terminated. There will be times when both of them will be selfish and won’t care even a little bit about what the other one is feeling. And this is something they should really work on making better. Because they are both impulsive, they will make decisions they will later regret. One rushed Aries would be more than enough for things to be fine. Imagine two of them. As soon as some problems between them arise, they will start to think they have hurried in choosing their partner and that the person they are with may not be the right one. Aries natives have a tendency to exaggerate with their own hopes and dreams. This means they may forget about what the partner wants and focus only on themselves. Even in bed, they will be more interested in receiving pleasure rather than offering it. Two Aries in love will look at each other like they are looking in a mirror. When it starts, the relationship between them is dramatic. They will be lost in each other, and they will make all kinds of romantic gestures to impress the other one. People will love to watch them evolve as a couple because they are flashy and charming. Adventurous, these two will go to many new places and discover all kind of new cultures. The surprise of a new emotion and the intensity at which they are felling things should be what makes two Arieses in a relationship tick. They will have enough passion to keep the fire between them burning, and their feelings for one another will always be strong. An Aries man who loved an Aries woman once will never be able to fall in love again. If they get married, they will both be happy and fulfilled. It’s good their relationship doesn’t require them to change their ways or what they believe in. This is a couple in which the partners will talk and help one another with whatever they can. Mutual respect is not something they will be strangers to, but they would definitely need to be more considerate of each other’s feelings. It’s a combination of two people in the same sign that will definitely work out. Both partners are honest and don’t take things too personally. Not to mention they are optimistic and able to move on when they fail. Arieses are people who get involved in relationships and want to stay. But many efforts are required for them to have the love of a lifetime. If they will respect each other’s individuality, they won’t have any problem keeping the fie between them alive. For the union between two Arieses to work, the partners need to think a lot of each other’s feelings and needs. If they are both emotionally mature and don’t fear they’ll get rejected, they can last together a lifetime. As an Aries man who wants to get an Aries woman, you should try and be gentler, especially during the first dates. Diplomacy and graciousness will make her respect you, which means she will fall for you very soon. Introduce her to your friends. She will be impressed. Show that you have dreams and that you are ambitious, and she will forever be yours. Putting the partner’s needs above their own could be something they can successfully try. It may not come easy, but it’s sure to have positive consequences. Problems in a Aries man – Aries woman couple may appear when one of them will be weak and the other one busy doing something else. If they are more supportive with each other, these two will be much happier as a couple. If one of them wants to take the lead and be the boss of the relationship for a while, the other one should submit. This is the only way to make this relationship successful. If you are an Aries woman and you are planning to get an Aries man, don’t be too straightforward or show all your talents from the beginning. He needs to know you are not that interested, for he loves to chase the woman he likes. However, this doesn’t mean you should be distant and flirt with other men. Keep things somewhere in the middle. If he has a temper, don’t boss him around. Be as feminine as possible and don’t nag him. The Aries man should let his lady know that her plans matter to him. She will be more confident that she has a partner in crime. If he treats her like a lady, she’ll know she’s the most important person in his life and will offer him lots of love. He also needs to keep in mind that she doesn’t mind the man leading while she controls from the shadows. For things to be perfect, they shouldn’t do to the other one what they wouldn’t want to be done to themselves. This can ensure they will be together for a lifetime.